(CNN) -- Jenny's phone number is for sale, but not for a song. 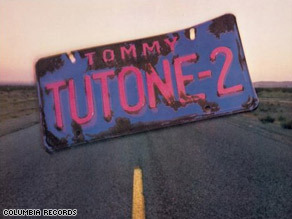 "867-5309/Jenny" originally appeared on Tommy Tutone's "Tommy Tutone 2" album. Bids for a New Jersey version of the number, stuck in the minds of millions since Tommy Tutone's "867-5309/Jenny" hit the Top 10 in 1982, had reached $5,100 on eBay as of Monday morning. The song is about a guy who finds Jenny's name and number scribbled on a bathroom wall. "This is really, in my opinion, one of the last cultural remnants of the '80s pop culture era ... other than the mullet," said Spencer Potter, a 28-year-old DJ who is selling the number he got for free five years ago. While Potter is overlooking the fact that "867-5309" is an active phone number in dozens of other area codes, it does get called a lot by curious people. Potter said he has gotten about 40 calls a day since he got the area code 201 version for his Weehawken, New Jersey, DJ business. "The minute we plugged the phone jack into the wall, it began ringing," Potter said. Mostly, Potter said, the callers are "a lot of '80s fanatics" and he lets the calls ring through to his voice mail. When he did answer a call three years ago, Potter found his own Jenny on the line. "She had been using my number to give out to guys that she didn't like at bars," he said. "It was a bum phone number." The young lady from Hoboken, New Jersey, told Potter she was just curious about who might be getting the calls. Potter ended up asking her out. "I figured if she was having to give out a bum number that often then she was probably pretty cute," he said. "We ended up meeting for drinks. We dated for awhile and it was actually a great friendship." Potter recently moved from Weehawken and decided to try to make money off the infamous digits with an eBay auction. Potter's DJ business goes with the number, a necessary provision to get around phone company rules against selling telephone numbers, he said. Phone companies technically own the numbers, not the customers. Potter said Vonage, the company that assigned the number, gave him permission to transfer it as part of the sale of his business. EBay halted a 2004 auction by the purported holder of the 212 area code version of the number, The New York Times reported. A Philadelphia-area resident who holds the toll-free versions -- both 800 and 888 -- said he values his numbers in the millions. Jeffrey Steinberg said his best offer so far, rejected several years ago, was for $1 million from a national weight-loss company. He acquired the numbers in the early 1990s for a pizza delivery campaign and has licensed them for other advertisers in the years since. Potter said when his auction ends next Monday, February 9, he hopes to make at least $40,000. He said he would use the money to take a Caribbean vacation -- away from his ringing phone. CNN's Laurie Segall and CNN Radio's April Williams contributed to this report.